The Folk Nation (also known as Folk) is an alliance of American street gangs originating from the Chicago area, in 1983. The gang has since spread throughout the United States, particularly to the Midwestern United States. They are rivals to the People Nation. Within the Folk Nation alliance there are multiple gangs, which have their own individual colors, hand signs and organization. The Folk Nation was formed on November 11, 1983, within the confines of the Illinois Department of Corrections. Larry Hoover, the chairman of the Gangster Disciple Nation, created the idea for the alliance and persuaded many leaders of large Black and Latino gangs from Chicago to join. Soon after its formation, the People Nation was formed to counter the Folks alliance. 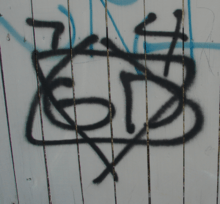 Gangs demonstrate their particular alliance-alignment by "representing" through the display of symbols, colors, graffiti, and numbers and letters. Folk Nation symbols are Winged Heart, Devil's Horns, 6-Dice, Number 6, Devil's Tail, Six Point Star (Star of David), Upside Down 5 and Crown, Broken Five Point Star, and a Pitch Fork. Folk Nation group members use right-handed identifiers to distinguish themselves from the People Nation groups, wearing articles of clothing to the right, such as caps, bandannas, or rolling up the right pant leg and using right angles. Folk Nation gangs use the term "All is One" to greet each other. ↑ FBI - Publications - Law Enforcement Bulletin - December 2001 Archived January 10, 2008, at the Wayback Machine.